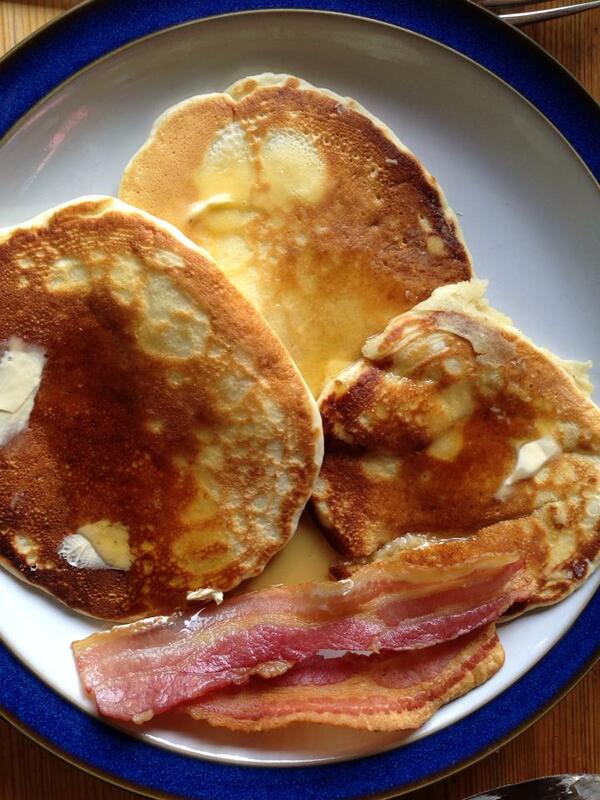 These are the pancakes my mum used to make, which I included in Fern’s Food. We’ve played around with different recipes over the years, but have pretty much settled on this one now. In another bowl, stir together the egg, milk and oil, then add to the dry ingredients. Beat only until combined, adding a little more flour if the batter seems too runny. Heat a frying pan and grease lightly. Ladle in about a quarter cup of batter per pancake. Cook until the edge of the pancakes begin to dry and lose their gloss, and bubbles rise and burst through the surface. Turn and cook the other side until golden brown. Serve hot with grilled bacon, butter and maple syrup.